Video and story adapted from the now-residing-in-the-public-domain film from 1978 – Buffalo Rider. Music, lyrics, editing and audio performance by Jomo Edwards of the Austin-based sardonic honky-tonk bluegrass band, The Possum Posse. 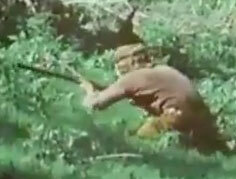 I absolutely lost it in part 1 when he buttstroked that Indian ROFL then broke his gun on a stump. What a random film.. I love it. Good God, that is the greatest thing I have ever seen in my life. This made my day. Hysterical. What’s that- a waterfall? Awesome. I guess the songwriter/narrator subscribes to the Randy Newman philosophy of songwriting. Holy crap this was so amazing! I will now compare every funny video I see to the Guy on a Buffalo videos. I just now noticed the explanation under the last video. I was wondering what the hell this was all about! LOL. I searched for the actual movie and it looks like you can watch the whole thing on Youtube! I want to know how they got a guy to ride a bison, as well as how they got a freaking cougar to maul him on camera without killing him. Hey, wolf, I got something for you! That has got to be one of the best things ever composed. That is better than the entire 2000s of SNL. Figures that comes out of Austin. That was the best video I’ve seen in a long time! Wow, after looking for this film for years, I have finally found it online. This film was for many years regarded as the rarest film of all time. I’am so surprised to have found it.